Recently, we wrote about Brooklyn's invasion of Rochester with West Elm. 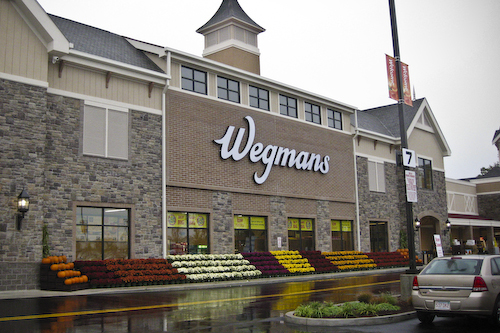 Now, the roles are reversed and Rochester is set to invade Brooklyn with Wegmans. Wegmans isn't a new concept to Rochester, in fact it's been around since the early 1900's when it got its beginnings as the Rochester Fruit & Vegetable Company. Not many places have a "hometown" grocery store like we do - and we probably take it for granted. Fresh produce, a great store brand, affordable prices, and top-notch customer service. Ask anyone who lives in NYC what their grocery buying experience is like and they'll probably sing a different tune: overpriced "organic" markets and bodegas with expired food. But that won't be the story forever. While it doesn't look like much, we know what it's going to become. ... and a great grocery store for the many MANY surrounding residential buildings within walking distance. Brooklyn, we're happy to share a piece of our home with you! While I've never called Brooklyn home, we do enjoy visiting every so often. Now we'll have no issue finding groceries! Following along with the Rochesteriat on Instagram, Twitter and Facebook. 1 year ago, our friends at Hart's gave us a sneak peek inside the soon to open downtown grocer. We were giddy with excitement to finally have a grocer downtown. And now, 1 year later - we're still giddy. Hart's has created a community gathering place and that's not going to change. 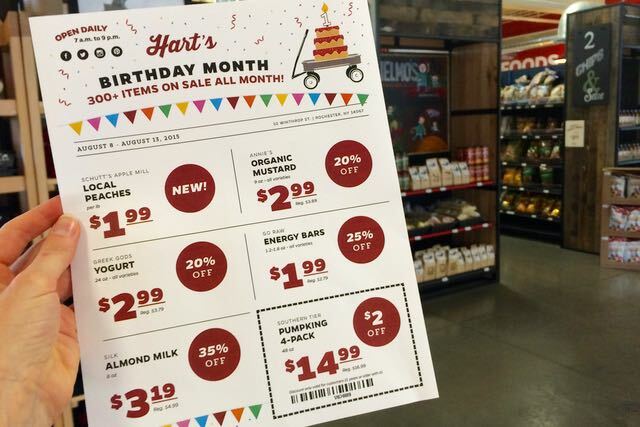 In honor of their 1st birthday, Hart's is throwing a bash and we're all invited. This Saturday, August 15th, from 12-3pm there will be over 25 local vendors setup sampling their goods, local musicians playing and the launch of a new Pittsford Farms Dairy ice cream flavor called "Hart's Happy Birthday"... and yes, there will be samples. Oh, and did we mention FREE cupcakes to the first 200 attendees? But, this is not just a 1-day celebration - it's a whole MONTH! Hart's has over 300 items on sale for the entire month of August, so make sure you peruse the aisles to see what deals are happening. Because who doesn't eat cereal and PB&J all the time (oh... is that only us?). It's so much easier to justify the sweets when they're on sale, right? Plus - we have it on good authority that these items are quite tasty. No department has been left behind: there are beers, baked goods, items in Frozen, as well as stuff for the home - so make sure you check every aisle. Not too long ago I was living in the East Village of Manhattan, as a single guy with not a care in the world, but also very little money after the rent was paid. I remember wanting to make a quick and easy dinner: why not go with cereal? Such a guy-thing, or post-college-I'm-starving-thing to do...all I needed was the cold milk and a bowl of my favorite sugary-marshmallowy packed goodness. This could only be $5 at most, no? That's when reality set in. New York City wasn't a place that was blessed by the grocery gods. It became all-too apparent that no matter where I went shopping in the Lower East Side, in Manhattan, or in the Tri-State region (Wegmans had not expanded quite yet) I was soon paying nearly $5 for the gallon of milk, and another $5 or so for a box of stale cereal that had been sitting on the shelf since Ed Koch was Mayor. What gives? In one word, and we all know it up here in Western New York: Wegmans. Most places around this country just aren't as lucky as we are. I guess the best thing about that is that they don't even know it, so let's call it "The Less You Know" campaign. Until Wegmans gets there, they'll just never know. So the point I am getting to is this: for those of us who grew up in this city (or have been here for some time) with the amazing Wegmans at our beck and call - helping us out with every aspect of our lives including everyday groceries, medications, birthday parties, super bowl bashes, lunch-time subs, etc. - we tend to take it for granted that we have it so good. Usually we don't even know that to be true until we leave this area for a place that doesn't know of Wegmans and all its glory. And it's not until we take a step back and see from the national spotlight how our local flavor is viewed in the eyes of others do we regain a sense of pride and astonishment as to what Wegmans really built in Rochester and beyond. With that, and with all the child-like wonder of Buddy-the-Elf, we'd like to say "You Did It! Congratulations!" We wanted to share some of the press that has been written on Wegmans in recent times, and congratulate them for some of their recent honors of being named in the Top 100 Best Companies To Work For by Fortune (again! ), Best Supermarket in America by Consumer Reports (2014), and America's Most Respected Retailer by Harris Polls (2015). Jason is co-Founder and Editor of the Rochesteriat. While the parking situation over at the East Avenue Wegmans leaves much to be desired, Amore Restaurant certainly makes up for it with their $5 pizzas on Tues, Wed, and Thurs nights. 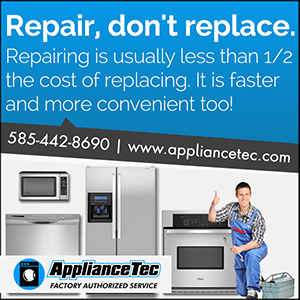 Check out more @theRochesteriat or Facebook.